Another question is how do I set my blog font to be more readable? I mean about adjusting the font size and the background colours etc. thanks. Your site is under construction mode and we could not check how it looks. Thanks Paul it worked. now, why are my posts not showing the Links i have inserted? Did you mean this link: https://healthsalmon.com/? The preview will appear if the domain is in our whitelist. hello Thai, I meant the text links embedded on my blog posts. to my Homepage https://healthsalmon.com/ instead of creating a button to this page? thanks. Do you mean you want to display the grid to your home page? You can add an Essential Grid element to your content built with Cornerstone. If I'm not understanding you correctly, please provide more details and screenshots. hello christian, i want my site home page to look like this site https://avocadu.com/ how do i achieve that look? thanks. Kindly open up new threads for additional questions as it will help us to focus on each issue and give you a better support which you deserve. Having a long thread makes the maintaining job harder and also it will be harder for the other customers to find the correct information if they have similar issues. You are always welcomed to reply to this thread to follow up the same question. 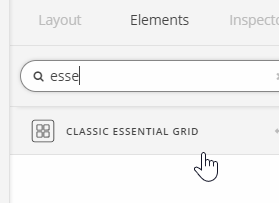 Now to answer your question, for the top Grid section you can use the Essential Grid plugin. For the lower sections, you can add a section for each case and set a background and add a parallax effect. The inside content can be mixture of the Image, Text and Button elements.